Since 1982, innovation, attention to detail and hygiene has been driving forces behind Eurobinox's success. Privately-owned company, Eurobinox detains excellent financial stability to invest and guarantee great future perspectives. Alongside the financial aspect, there is, above all, a team empowered by drive, the drive to continually progress. Always there for the customers, our team is trained in the latest techniques in order to give real value-added to products and services. 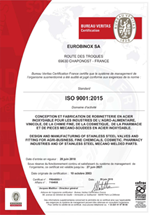 Illustrating the importance we place on quality is obtaining ISO 9001:2000 and applying the ATEX directive. Under this certification, each piece is individually marked in order to identify it and assure its traceability from its origins throughout the product's lifespan. Digital orders, digital welding machines, robots, we master each development phase, from steel-cutting to the manual placement of the joints, and from manufacturing to polishing. Electrical equipment, Specific valves and others. Accessories, Pipes, Unions, Tees, Elbows and others. SMS, Din, RJT, ISS FIL, MACON.